Great news! Easybook is offering an amazing promotion for Etika Express bus tickets right now. Passengers can now enjoy 15% discount for all Etika Express routes this month! 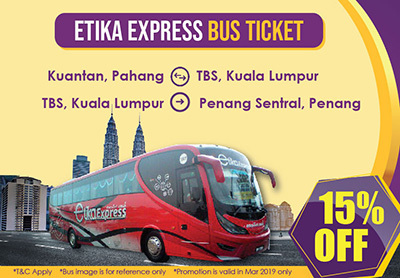 Etika Express has a strong presence up north, often connecting places like Alor Setar, Sungai Petani, Kuala Perlis and many more to Kuala Lumpur. Etika also operates from Kuala Lumpur to cities in the east coast such as Kuala Terengganu and Kuantan. Popular routes including round trips between Kuantan to Terminal Bersepadu Selatan (TBS) and a one-way trip from TBS to Penang Sentral. This offer is valid for the entire month of March 2019 in Peninsular Malaysia only. Be sure to book your bus ticket on the Easybook website now to receive great discount! You can also download our mobile app for iOS and Android to enjoy the 15% off on Etika Express bus ticket bookings.